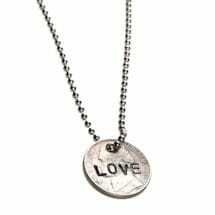 "Love", "Hope", "K + T"… any of these sentiments would be perfect for this hand-stamped penny necklace. 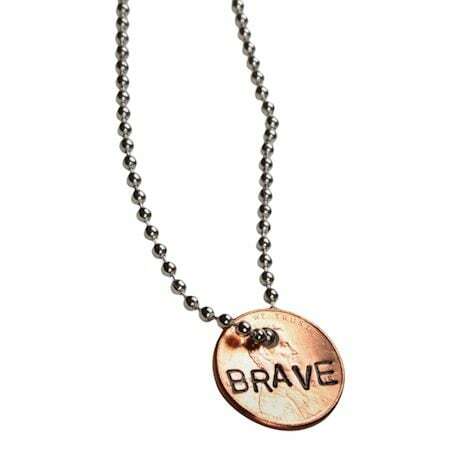 Choose up to 5 characters to make a word, name, or initials and it will be hand-stamped and enameled in black ink. Penny comes strung on a 30" nickel-plated stainless steel ball chain. Penny year will vary depending on artist's stock available at the time of purchase. Made in the USA. Please allow 2 weeks for delivery. No rush or overnight shipping. No gift box. Item can only be shipped within the Continental US.